RIO DE JANEIRO – Coca-Cola Brazil’s four-year marathon of planning and preparation for Rio 2016 turned into a spirited sprint as the start of the competition drew closer. We caught up with James Williams, marketing and sponsorship director, two days before opening ceremonies to learn about his team’s Games-time plans and the legacy Coca-Cola hopes to leave on the host city. Can you give us a sense of the scope of a project like this? 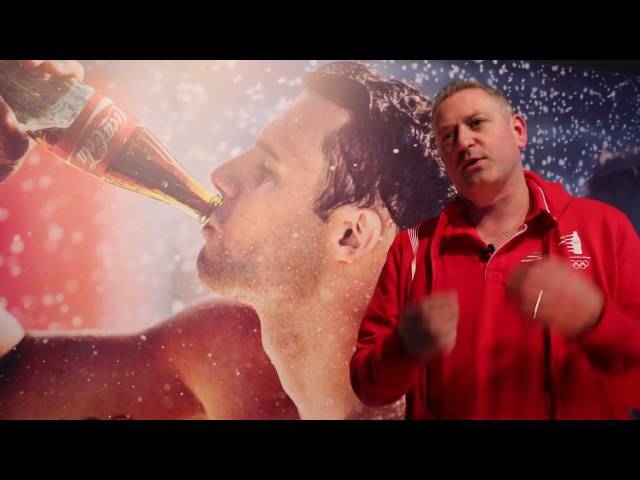 How many people are involved in activating the 2016 Rio Olympic Games for Coca-Cola? The team starts with our GM, Flávio Camelier. He was brought in before the London Games, which I worked on in Great Britain. I came onboard here in early 2013. So it starts with just a couple of us, then the team grows and grows. Under my area, I look after the Olympic Torch Relay, which spanned 95 days and reached 330 cities across Brazil. It’s a huge piece of experiential marketing. That team of about 100 people has been on the road for about three months and just arrived here in Rio. Then the rest of the team grows steadily. Before all the activators came onboard, my team was 10 to 15 people. And then there are all the other parts of Flávio’s broader team – from venue operations, to communications – who are all linked with the local marketing teams in Brazil. So a big challenge for us is to integrate all the pieces. It’s been a long, fun journey to this point… so we’re hugely excited. How many members of your team worked on the 2014 FIFA World Cup and 2012 London Olympic Games? We’ve built up a team made up of a number of components. One is experience, so we have four people who came from London. They worked on the 2012 Olympic Torch Relay and Games-time experiential for Coke. It’s also important to add local flavor and culture, because you need to understand how Brazil works. So we have a few people who worked on the Confederations Cup in 2013 and the FIFA World Cup in 2014. And finally we have people we brought in to provide fresh eyes on something we’ve done a number of times. We’re here inside Parada Coca-Cola, which is incredible. Tell what you’ve created with this space, and what fans can expect over the next few weeks. We have two very key elements of Games-time experiential. One in Olympic Park and here at Parada Coca-Cola, or Coca-Cola Station. This is a big piece of innovation we’ve driven this year. This space integrates different parts of our business – real-time marketing, global licensing and retail, and experiential marketing. The experiential is 100 percent focused on teens and creating experiences they can share on social media. And the real-time marketing newsroom is where we share content not only across the whole of Brazil, but the whole of the world. How does this experience ladder up to Coke’s #ThatsGold campaign? One of the best things about this is that on a number of evenings throughout the Games, we’ll host events where we invite teens to celebrate and share their “gold” moments. Because we believe gold is for everyone. It’s not just about the podium… but how it relates to you and your friends in your own personal lives. That’s the nugget of the campaign. We’ll bring in athletes, influencers and musicians and put on these amazing events that culminate in a gold moment. I’m picking up on a thread here. The Olympic Torch Relay brought the Olympic spirit to Brazilians across the country, and Parada Coca-Cola is about giving teens who may not be able to see the events access to the Rio 2016 experience. Is that right? Yeah, that’s one of the reasons we chose this spot. In Olympic Park, we have the #ThatsGold experience, but this is where everyone who can’t get tickets can come. We made a decision early on to focus our investment here because we can reach more teens who want to experience the Games on their own terms. Tell us about this area of downtown Rio and, specifically, the Parada Coca-Cola space. What was it before, and what will it become after Games? One legacy of the Rio Games is to transform the city from a transportation standpoint… and part of that focuses on this port area, which has undergone a transformation. There’s a great museum here, along with several nice bars and restaurants. You can wander around. The warehouse space we’re in here used to be a customs entrance. If you came in on a cruise line, you’d dock here to go through customs and enter Rio. We stated working with the city early on, knowing what was important to them. It’s been about coming together to drive those commonalities and become part of the legacy of the Rio Games… which is very important to us. And we’re in a warehouse, which – let’s face it – is pretty cool for teens. This has hosted some great parties in the past, so hopefully we’ll be the can’t-miss party here during the Rio Games.